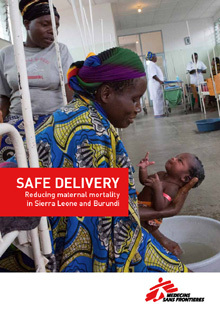 Operational research from MSF projects in Burundi and Sierra Leone indicate that it is possible to achieve a rapid and substantial decrease in maternal deaths of up to 74 percent by providing access to emergency obstetric care. Jeannine Ntunzwenimana, 20, was seven months pregnant when her water broke. She was picked up by an MSF ambulance and brought to the emergency center for gynecological and obstetric care, where she gave birth safely and her baby received care. Operational research from MSF’s projects in Kabezi, Burundi, and Bo, Sierra Leone, indicate that it is possible to achieve a rapid and substantial decrease in maternal deaths of up to 74 percent by providing access to emergency obstetric care. MSF’s research is the first of its kind to quantify the impact of such a model of care on maternal mortality in an African setting. Despite being highly avoidable, maternal mortality continues to be a major problem in many poor countries. A woman in Sierra Leone is over 200 times more likely to die giving birth than a woman in Sweden. Some 287,000 women worldwide die each year giving birth, leaving behind children who—as a result of their mothers’ deaths—are ten times more likely to die prematurely. Doctors Without Borders/Médecins Sans Frontières (MSF) has extensive experience of providing maternal care across the world. In 2011, MSF assisted 192,000 women in delivering their babies. 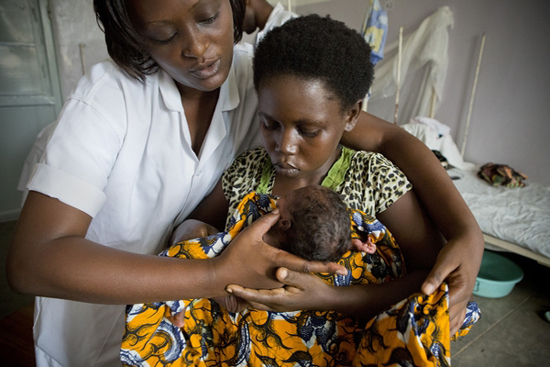 MSF has been working to save the lives of mothers in Burundi since 2006 and in Sierra Leone since 2008. Both are countries with extremely high rates of maternal mortality, due to problems around access to good quality emergency obstetric care, linked to shortages of qualified health staff, a lack of medical facilities and health systems that have been shattered by years of civil war. MSF’s maternal healthcare model in these two countries consists of an ambulance referral system that transports women in need of emergency obstetric care to an MSF referral hospital. The comprehensive emergency obstetric care provided at the hospital is offered 24 hours a day, seven days a week, and all services are free of charge. MSF estimates for 2011 indicate that maternal mortality in Burundi’s Kabezi district, where MSF is the only emergency obstetric care provider, has fallen to 208 per 100,000 live births, compared to a national average of 800 per 100,000 live births—a 74 percent decrease. For the same year, in Sierra Leone, MSF estimates indicate that maternal mortality in Bo district has decreased to 351 per 100,000 live births, compared to 890 per 100,000 in the rest of the country—a 61 percent reduction. The total annual running costs of these programs are equivalent to just €1.5 for each person in Bo district and just €3.2 for each person in Kabezi district. These programs do not use state-of-the-art facilities or equipment. The results show that, with a relatively small investment, it is possible to achieve a rapid and substantial decrease in the number of women who die in childbirth. An international point of reference is the fifth Millennium Development Goal of reducing maternal mortality by 75 percent by 2015, compared to the national ratio in 1990. MSF’s estimates indicate that the maternal mortality ratio in Kabezi district is already below this level. In Bo district, MSF is confident that its intervention will result in a 75 percent reduction by 2015. The model of emergency obstetric care delivery that MSF has adopted in Sierra Leone and Burundi is saving a significant number of mothers from dying from pregnancy-related complications. MSF’s positive experience from these countries can serve as an encouraging example for donors, governments and other NGOs who are considering investing in a functional and effective referral system and 24/7 emergency obstetric care in countries where maternal mortality is high and access to emergency obstetric services is limited.